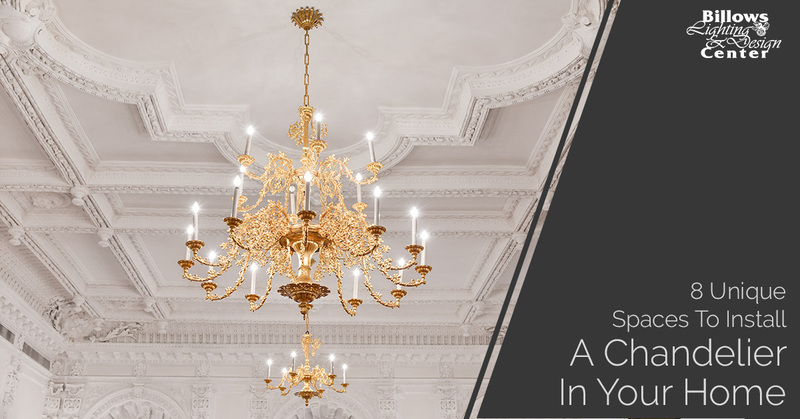 Installing a chandelier in your home is a phenomenal way to add an upscale element of design to any room, whether it be a more traditional room like your dining room, or something completely out of the box — which we’ll go over in this blog post. At Billows Lighting and Design Center, we have a large selection of ceiling lights for you to choose from, including an array of chandeliers. Our chandeliers in our Berling lighting showroom range in size, finishing and style, so you’re bound to find something that matches your personal taste. We take pride in being the home of all things lighting, and as a family-owned-and-operated business, our team of lighting consultants does its best to connect the local community with ideal lighting solutions while staying within budget. Schedule an appointment with us today. Below, we’ve listed at least eight unique spaces in your home where you can install a chandelier. We hope you find some inspiration from this post! This room of mundane Sunday chores can be turned into one of your favorite rooms in your home when you add either a bold statement piece chandelier or a classic crystal chandelier fixture. You can install this chandelier either smack-dab in the middle of your laundry room or a smaller one above your washer and dryer for adequate illumination. Whether you opt to install a chandelier above your bathtub for an elegant and relaxing effect, or you install two smaller chandeliers above your double vanity’s sinks, adding chandeliers in your bathroom is the perfect way to enhance the aesthetic of a room that you use daily. Hear us out — installing a chandelier in your walk-in closet will change your life, especially if you have a large enough closet that has enough room for one. No matter the style or size you opt for, you will feel like the owner of a palace daily when you walk into your closet every morning to choose your outfit for the day. You can also install this chandelier with a dimmer to adjust how bright your closet gets, which is an ideal solution when determining if you’re grabbing your navy or black sweater in a rush. 4. In Your Outdoor Spaces. If you didn’t know there was such a thing as outdoor chandeliers, prepare to have your mind blown. Outdoor chandeliers are ideal to install above any outdoor furniture set-ups or outdoor dining tables in your backyard, but they also look great installed above your front door. They are also designed to withstand any inclement weather conditions, unlike an indoor chandelier. 5. In Your Home Office. Turn a room of labor into a room with a bit more glamour by simply adding a chandelier fixture. Just because you’re the only one who will likely be using this room doesn’t mean you can’t splurge a little bit. Adding a chandelier will give your home office a chic, contemporary look that will make you feel like your personal office is in a trendy skyscraper in New York rather than attached to your home. OK, so hanging a chandelier in a bedroom isn’t exactly unique in nature, but where you decide to hang your chandeliers in this room is what makes this strategy unique! One of our favorite trends is to hang two smaller chandeliers alongside both sides of your bed, likely above your side tables. This not only saves you some table space, but it also gives you a practical and gorgeous lighting solution for when you want to read in your bed late at night. 7. Your Children’s Rooms Or Nurseries. This is more of a suggestion for the parents with less rowdy children in your home, since you probably don’t want to install a chandelier in a room where your children will likely throw a football around. Regardless, installing a chandelier in a child’s room or baby nursery is a simple way to enhance the overall appearance of the room, and a great alternative to any traditional, fluorescent lighting options. Rather than just placing a chandelier above your entryway or in your general foyer area, we suggest hanging a chandelier above any of the staircases in your home for a simple yet elegant design effect. 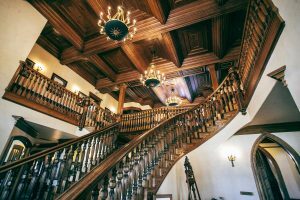 If you have a spiral staircase, a staircase with a landing or a staircase with architectural details, you’ll find the illumination of the chandelier to be especially beautiful. If you think the traditional placement of chandeliers in your home is growing stale, shop our collection of chandeliers in Berlin today. We’ll be more than happy to connect you with properly sized chandeliers that can fit in any of the unconventional rooms and spaces of your home. For additional tips and advice regarding chandelier design or placement, check out our educational blog as a resource. If you have any further questions, feel free to reach out to our team of professional lighting experts by calling (856) 281-1399 or by completing our online form. Also, to see our collection of chandeliers or other lighting products in person, feel free to stop by our Berlin lighting showroom!